Hallendy, Norman. "Inuksuk (Inukshuk)". The Canadian Encyclopedia, 26 October 2017, Historica Canada. https://www.thecanadianencyclopedia.ca/en/article/inuksuk-inukshuk. Accessed 18 April 2019. Inuksuk (also spelled inukshuk, plural inuksuit) is a figure made of piled stones or boulders constructed to communicate with humans throughout the Arctic. Inuksuk nalunaikkutaq pimmariusimajumut - an inuksuk marking the place of an important event. This inuksuk at Kinngait, southwest Baffin Island, was built by women at the command of Angacok, a shaman (courtesy Norman Hallendy). Inuksuk (also spelled inukshuk, plural inuksuit) is a figure made of piled stones or boulders constructed to communicate with humans throughout the Arctic. Traditionally constructed by the Inuit, inuksuit are integral to Inuit culture and are often intertwined with representations of Canada and the North. 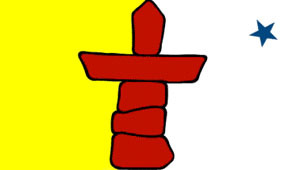 A red inuksuk adorns the flag of Nunavut. In Inuktitut, the term inuksuk means "to act in the capacity of a human." It is an extension of the word inuk meaning "a human being." Inuksuit have been found adjacent to archaeological sites dating from 2400 to 1800 BCE (see Prehistory) in the Mingo Lake region of southwest Baffin Island. While stone figures resembling human forms are often referred to as inuksuk, such figures are actually known as inunnguaq. Inuksuit are placed throughout the Arctic landscape acting as "helpers" to the Inuit. Among their many practical functions, they are used as hunting and navigational aids, coordination points and message centres (e.g., they might indicate where food was cached). In addition to their earthly functions, certain inuksuk-like figures have spiritual connotations, and are objects of veneration, often marking the spiritual landscape of the Inummariit — the Inuit who know how to survive on the land living in their traditional way. The Inuit also construct a stone figure called an inunnguaq, which means "in the likeness of a human." This familiar stone figure with head, body, legs and arms is often mistakenly referred to as an inuksuk. Its purpose is more symbolic than functional. Because of its humanoid appearance in the likeness of a little person, its image has become a popular cross-cultural symbol. The most common inuksuk is built with stone placed upon stone. It may also appear as a single upright stone, or as cairn-like structures created by stacking boulders. The nature of the local stone largely determines the shape and size of the inuksuk, and how it is constructed. Rough, irregular igneous rocks and large flat boulders of varying thickness allow for the construction of limitless shapes; boulders, on the other hand, are more challenging to work with. Rounded boulders offer the least possibility of variation in shaping an inuksuk; they can only be stacked into a pyramid. 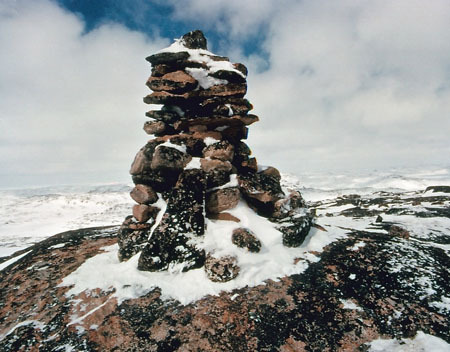 An inuksuk constructed of boulders tends to be massive because of its base-to-height ratio, and is referred to as an inuksummarik or an inuksukjuaq, often constructed to serve as important directional aids. There are four general shapes of inuksuit that are easily recognized and that show their surprisingly wide range of expression. The most elementary kind of inuksuit is the nalunaikkutaq, which literally means "deconfuser" and is made of a single upright stone placed on its end. A second group is the tikkuuti, which are pointers of different sizes and shapes. Tikkuuti can appear as triangular-shaped rock lying flat on the ground or as simple but useful arrangements of rocks appearing in a straight line, with the largest rock at one end grading down to the smallest at the other end, indicating the direction to be taken. The third type is an inuksummarik or an inuksukjuaq, which is noted for its larger than average size. Easily seen from a distance, these large inuksuit act as major coordination points. Finally, there are inuksuit that have clearly been used as message centres in addition to their original purpose. You can find an arrangement of stones at their base left by a hunter for a follower. Besides indicating the location of a cache or where an object had been hidden, such an arrangement may signify a change of direction from an intended course, or serve as a precaution or a sign for the follower to go to an alternative location or to the camp of a relative. For example, if a hunter lost a harpooned seal in shallow water, the hunter's companion may align two stones on shore pointing to where the seal went down, allowing it to be retrieved later. The configurations that shape these messages are known between hunting partners and often among members of their family. Beyond being stacked one atop the other, large slabs of stone can be arranged in a number of ways. They can stand on end to form supports for a lintel and thus become an elaborate structure rather than just a heap. 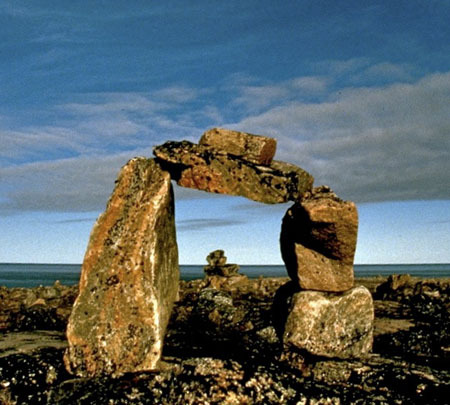 Many inuksuit, referred to as niungvaliruluit, are constructed with a "window" through which one can align with another inuksuk and thus project a sightline to a place below the horizon. Such an inuksuk, even when aligned to point the way to a mid-winter constellation, may not have served a strictly utilitarian purpose. After all, experienced hunters knew the direction of such places. Rather, as Inuit elder Osutsiak once explained, alignments were often constructed by those who felt the need "to attach their thoughts" to distant and familiar places, especially when they were a long way from home. Among the largest and most conspicuous inuksuit are those that direct the traveller by acting as indicators. Before someone inexperienced embarks on a trip, someone who is familiar with the area being traversed shares information on the appearance and message of particularly significant inuksuit. To knowledgeable eyes, indicator inuksuit can communicate vital information such as: depth of snow; safe or dangerous crossing places; where ice is dangerous in spring; the deep or shallow side of a river; where there is plenty of game or where fish spawn; where food or supplies are cached; where there are good hunting grounds for seal, walrus or whale; and where there are hauling-out places for seal and walrus, or landing sites for boats and kayaks. A tuktunnutiit announces a rich caribou hunting area by sporting antlers and sometimes scapula, driftwood or walrus skulls. Some inuksuit on the southwest coast of Baffin Island are erected to warn travellers of dangerous currents beneath thin ice. These inuksuit are dismantled at the approach of summer. Many other inuksuit are used as navigational aids. They can indicate the best route home, the position of the mainland from a distant island, the direction of a significant place inland, such as a ceremonial site, major transition points between water and land routes and the locations where fog is prevalent between islands. They can also act as astronomical sight lines, lining up the viewer to the pole star and the mid-winter moon. While some stone arrangements may appear to be inuksuit, their purpose is not "to act in the capacity of a human." Some, such as the inuksuk inuktaqarniraijuq and the innunguaq sport arms and symbolize the presence of humans, perhaps informing Inuit whalers of a meeting place. Angaku'habvik, where shamans were initiated in the Keewatin region, is still regarded as an object from which one keeps a safe distance. Sakkabluniq, a fractured boulder fronted by a red stone, was once believed to possess spiritual power. And a tunillarvik, which appears to be merely a rock standing on end, is actually where gifts are left with the hope of receiving protection from helping spirits. Many Inuit retain strong attachments to inuksuit believed to have been built by their ancestors. Some of the old inuksuit are mentioned in Aya-yait, the traveling songs passed from one generation to the next to help travelers remember a series of directions for long trips. Often these inuksuit are venerated regardless of their function. 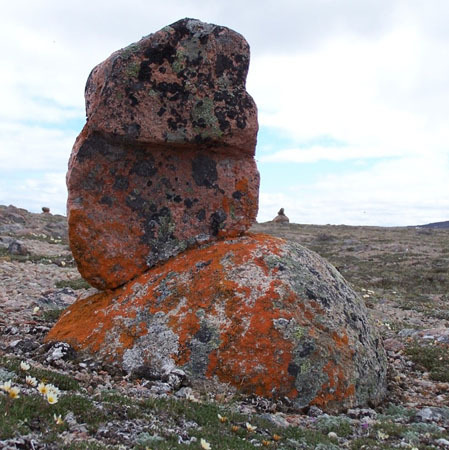 For instance, Inuksullarik on southwest Baffin Island is an ancient inuksuk fused with black lichen and believed to have been built by the Tuniit (whom the Inuit consider their Arctic predecessors). Norman Hallendy, Inuksuit:The Silent Messengers (2000). Watch the Heritage Minute about Inuit stone figures referred to as Inukshuk. See also related online learning resources. From Historica Canada.